Nuno Sales Da Ponte, Miriam Hernandez, Ana Paradela, Rafael del Castillo, Managers of Expedia Group. Punta Cana, Dominican Republic.– Expedia Group, the world’s leading travel platform, reinforced the importance of their collaboration in the growing and success of the market. 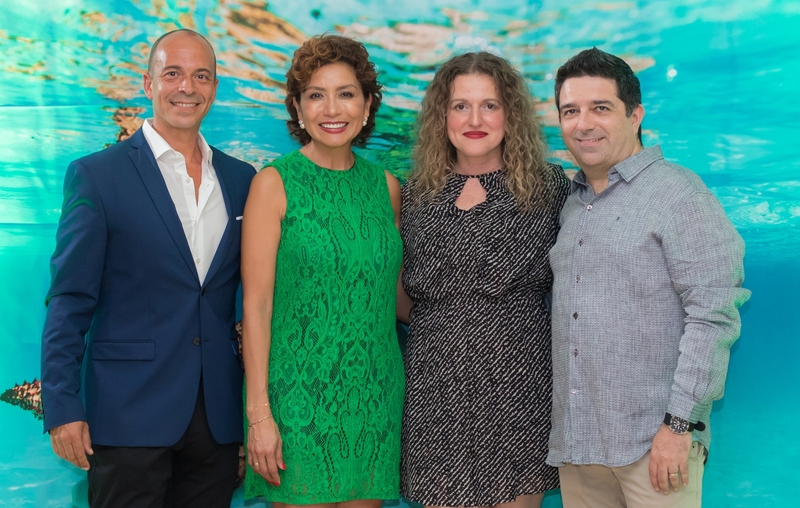 Prior to the DATE 2019, Miriam Hernandez, Director of Market Management in the Caribbean, and Rafael del Castillo, Senior Director Mexico Resorts and Caribbean Market Management, both for Expedia Group, hosted an appreciation cocktail for hospitality executives and members of the local industry, in which they presented the 2018 growth data results for the Dominican Republic. “We understand the value of our travel partnership; therefore, we develop technology that drives business results for our travel partners. The value we provide is more than just listings. Our tools, data and insights help our travel partners stay trendy and successful.” said Miriam Hernandez. “We are really happy to be here with our travel partners and local industry, and to reiterate our commitment to the Caribbean, as this region continues to be a significant market for us as a company,” added Martinez. During the event, they mentioned that the country remains as a popular market across Expedia Group’s travel platforms. For 2018, the international demand to Dominican Republic grew 15% YoY, with Punta Cana as the top city preferred by international travelers. It was followed by Santo Domingo, Puerto Plata and Samana, in that order. They added that even though the US keeps as the top international feeder market to the city, Spain is the one that grew the most with 200% in demand YoY, followed by Brazil (90%), France (30%) and Canada (15%). They also identified a spike in demand from the French and Italians during January, February and August, while Canadian travelers showcased an increase in demand during December . For travelers coming from the US to Dominican Republic the demand increased more than 16% YoY, with Macao, Bavaro, Uvero Alto and La Romana – Bayahibe, Cabeza de Toro, Puerto Plata, Santo Domingo, Boca Chica, Sosua and Samana, as the top ten in-demand cities . Regarding the travelers’ behavior, according to Expedia Group’s number, the four-star properties made up almost 60% of bookings; and the average booking window was 49 days and the length of stay was 4 days. Otherwise, the app transactions grew 50% YoY; the top city for mobile demand preferred by international travelers was Punta Cana . By hosting the event and showing the Dominican Republic market results, Expedia Group continues positioning as a world class marketing and technology provider that puts its data to work for its travel partners and that powers worldwide travel industry through information and innovation. They offer different tools and solutions that help travel partners to drive incremental revenue and acquire new customers, but also work hand in hand with other stakeholders within the travel industry to continue to bring international travelers to the Caribbean destination.